Planar Monolithic Industries (PMI) recently introduced four new products in their extensive line of RF and microwave components. Included are a 2-18 GHz threshold detector, a 0.5 to 18 GHz high power limiter, a 6.0 to 18.0 GHz 8-bit digital phase shifter, and a 0.1 to 2.0 GHz successive log video amplifier. Contact PMI today for more information. PMI Model No. 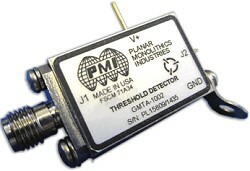 GMTA-1002 is a threshold detector designed to operate over the frequency range of 2.0 to 18.0 GHz. It has a threshold level of -23 dBm with threshold stability of +/-3.0 dBm over frequency and temperature. Other specifications Input Operating Range of -18 to -23 dBm, Input VSWR 2.5:1 maximum, maximum input power level +10 dBm (without damage), Response Time Any Input Greater than 3 dB = 100 µs and operates using +12 VDC @ 50 mA maximum. Supplied with SMA(F) connectors in a housing measuring 1.0" x 0.65" x 0.3". PMI Model No. LM-0518-10-1W-SHS-2-F is a high power limiter that operates from 500 MHz to 18 GHz. This limiter handles 100 Watts Peak Power with a pulse width of 1 µs. The insertion loss is only 1.5 dB typically and has a VSWR of 2.0:1 maximum. 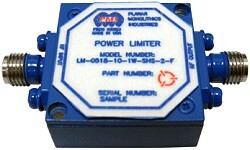 This limiter is supplied in a small housing measuring only 1.0" x 1.0" x 0.4". PMI Model No. 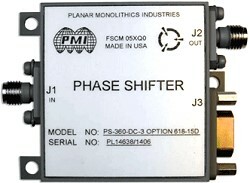 PS-360-DC-3 OPTION 618-15D is an 8-bit, Digitally Controlled Phase Shifter provides range of 360° in 256 Steps over the 6.0 to 18.0 GHz frequency range. This unit has a typical insertion loss of 10 dB, accuracy of ±15° Max (Peak to Peak) - Measured ±6.6°, PM/AM of ±2.5 dB Max - Measured ±1.2 dB and a VSWR of 2.0:1 Max It is supplied with removable SMA (F) connectors in a housing measuring 1.6" x 1.75" x 0.5". PMI model SDLVA-0120-70-100M2G-10DBM is a successive detection log video amplifier (SDLVA) that operates between the 0.1 to 2.0 GHz frequency range. Offers a dynamic range of 70 dB minimum and a TSS of -65 dBm. This unit offers a maximum rise time of 25 ns and a fall time of 30 ns. This model provides a limited IF output of +10 dBm typically. This unit is supplied in a housing measuring 3.75 " x 1.50 " x 0.40" with SMA female connectors.